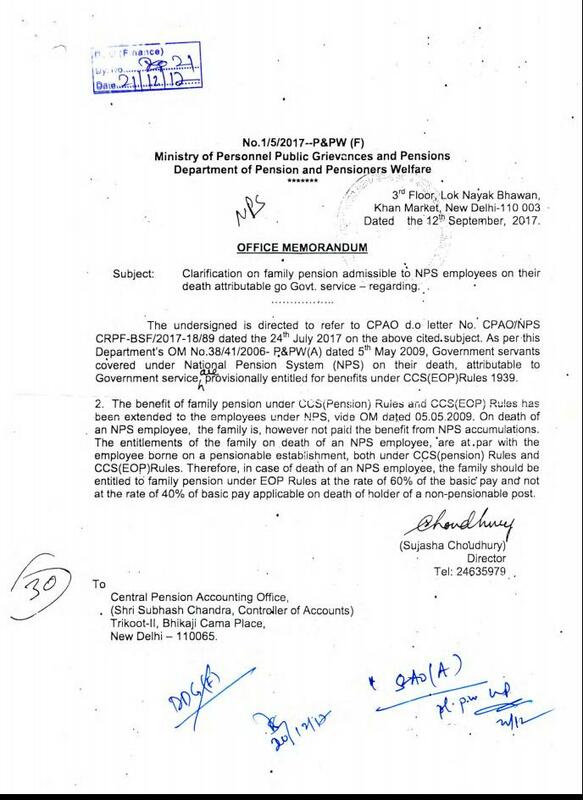 The benefit of family pension under CCS(Pension) Rules and CCS(EOP) rules has been extended to the employees under NPS, vide OM dated 05/05/2009. On death of an NPS employee, the family is, however not paid the benefit from NPS accumulations. The entitlements of the family on death of an NPS employee, are at per with the employee borne on a pensionable establishment, both under CCS(pension) rules and CCS(EOP) Rules. Therefore, in case of death of an NPS employee, the family should be entitled to family pension under EOP rules at the rate of 60% of the basic pay and no at the rate of 40% of basic pay applicable on death of holder of a non-pensionable of post.